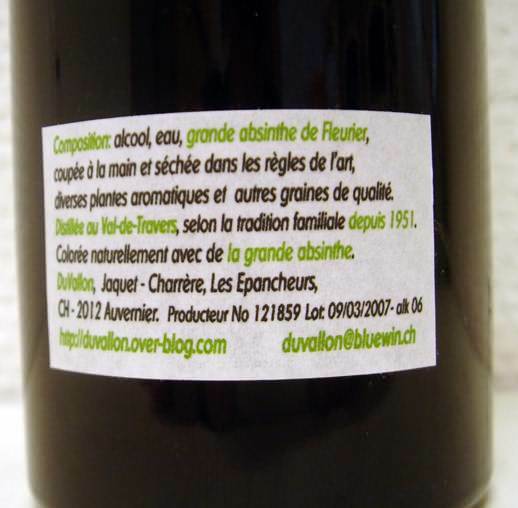 From the distillers of the quite nice La Bleue, DuVallon, a new absinthe was released a short while back. 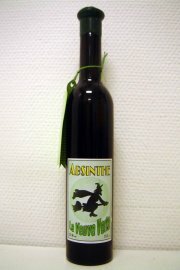 One of the very few Swiss green absinthes. The first question that comes to mind is of course if this is going to be a great pioneer for other "La Bleue" distillers to start cooking up vertes. After all, there are plenty of La Bleues on the market today. Now then, the packaging makes me somewhat confused. I like the bottle and that it's wax-sealed. 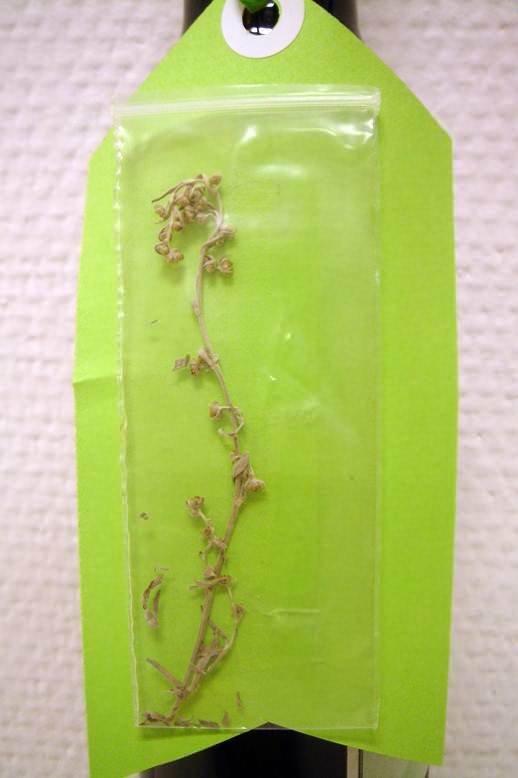 I like how the added tag with a little information and a dried twig of wormwood in a little ziplock bag adds to the artisanal feel of it but I don't quite like the label. It looks like an Easter-bunny special with the Wicked Witch on her broom. Sure enough many of the small Swiss distillers tend to have labels that look less Belle Epoque and more "modern" but many also look very unprofessional, like they're simply printed on the home ink-jet. Sadly, that takes away quite a bit of the notion that it's a quality product you're holding in your hand. Labels aside, we need to try what's inside the bottle... Given that their DuVallon La Bleue is a quite nice absinthe, especially their latest edition of it with a bit more wormwood in it I had my hopes up for this one. The nose first presents a profile very similar to most La Bleues with a nice touch of Fennel, Anise and Wormwood accompanied by Melissa and a hint of what could be mint. Right after that another smell of Wormwood appears, and it's not fine distilled floral Wormwood. No, it's macerated Wormwood that hits the nose. That does ruin the otherwise nice profile. Pouring a dose in the glass reveals the next thing, the color. The color of the Veuve Verte isn't very green at all. It's a very very pale green with hints of yellow in it. Very similar to the Z'Graggen and the Segarra 68. A disappointment. Adding water to it provides a very nice and thick louche as expected and the color turns more white, retaining only the faintest hint of green in it. The aroma has developed a bit and is more complex and floral than before - a good sign indeed. The only question now is how it all holds up for drinking. Well, the mouth-feel at first is very full, rich and creamy - as with most La Bleues. Just when a slight numbing is developing a very irritating bitter dryness is sneaking up from the back of the mouth desperately holding on to the tongue. Immediately after swallowing that sip the mouth is left with this very bitter dry feeling. Without a doubt (and yes, it says so on the back label as well) this is colored using Artemisia absinthium. A major mistake! I assume that this is more or less a colored version of the DuVallon La Bleue. To be honest, it should have been left alone. 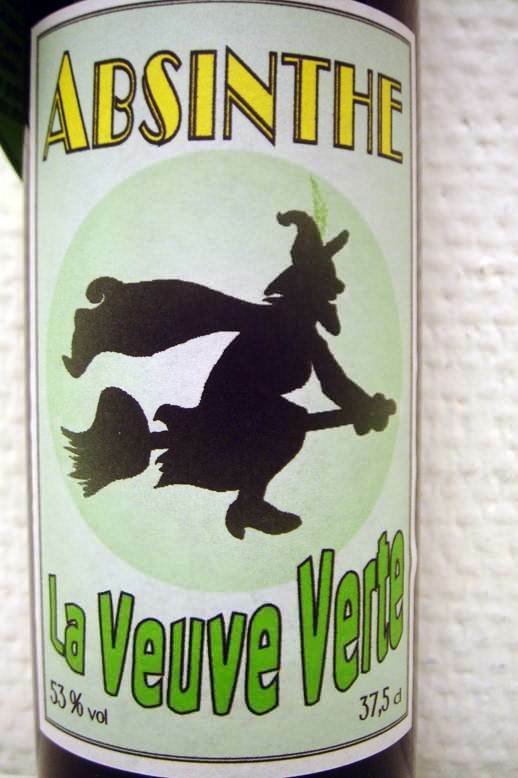 If they would use proper coloring herbs instead of the one herb you should never use for coloring absinthe - Artemisia absinthium - I am sure they could have come up with a very nice verte. Sadly, this isn't a very nice experience and it requires a good bit of sugar if you really want to drink it. So, what's there to say? Well, first of all - do not color absinthe with grand wormwood. 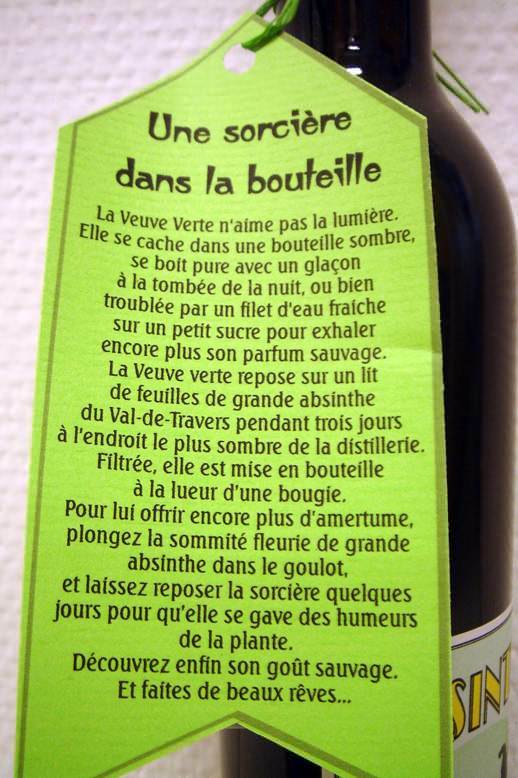 Second, behind that mistake I can certainly detect a good quality absinthe and if it's not the same recipe as the regular DuVallon, they should simply consider using other coloring herbs and this will become a nice product.